In one of our favorite Simpsons episodes, Treehouse of Horror VI, Homer falls through a hole in the space-time continuum and ends up on a real life 3D sidewalk in Hollywood. That was fiction. 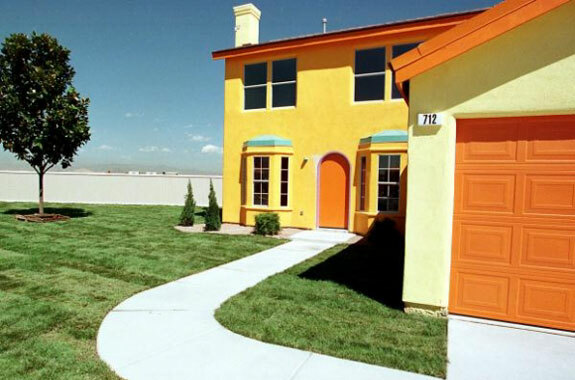 But this is not: a house that looks like it was transported directly from the cartoon world of The Simpsons onto a real world piece of land in Henderson, Nevada. The house was built in 1997 as part of a contest. The architects faced some challenges bringing the animated house to life. It turned out that the TV show house didn’t have any load bearing walls. The garage of the cartoon house was not physically large enough to contain a car (much less all the stuff Homer borrowed from Flanders). The land appropriated for the construction could only accommodate a 40 foot wide house—the TV version was deemed to be the equivalent of 50 feet. And then there was the issue of the house itself changing over the years. 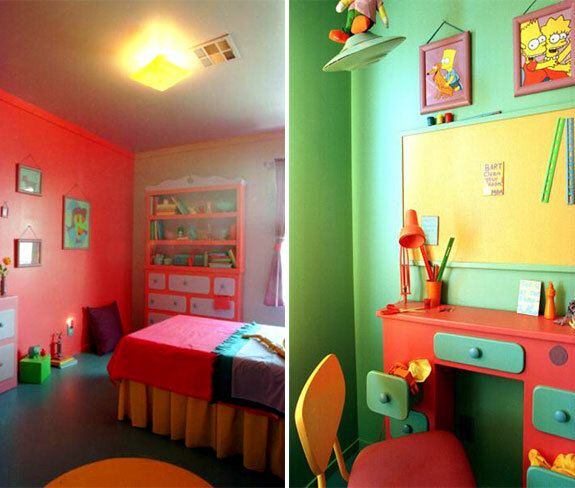 In the end, the architects figured that their real life house managed to incorporate 90% of the cartoon version. The house grounds even includes Bart’s treehouse, a swing set and a back yard barbecue. We think they did an outstanding job with the design. Judge for yourself in the photos, below. Unfortunately, the winner of the house giveaway contest chose an alternative cash prize. The people who eventually ended up with the house painted the exterior a less cartoony color. 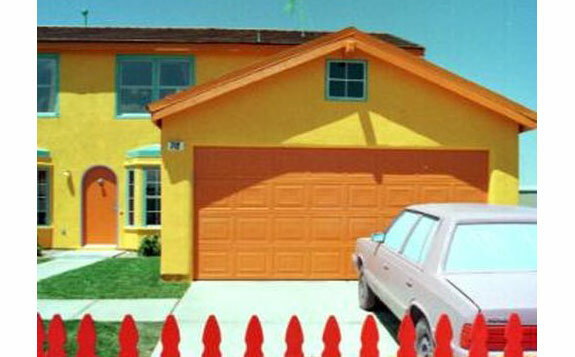 If you were to drive by the house today (it’s at 712 Red Bark Lane) you probably wouldn’t know it was a Simpsons house . . . unless you were to look down at the sidewalk in front where Matt Groening, the Simpsons creator, drew a picture of Bart and signed his name. I think that even though this house is real, it doesn’t appear that it is livable. 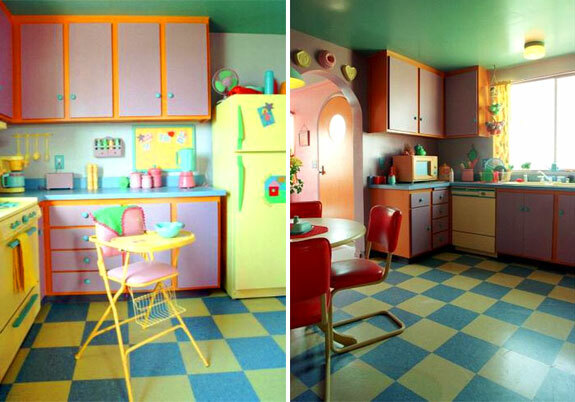 The kitchen alone looks as though everything was custom made just to make it the same as in the cartoon. I really don’t see why we need to bring the cartoon to life. Why not leave the Simpson’s in the world of imagination and stop trying to combine them with the real world. 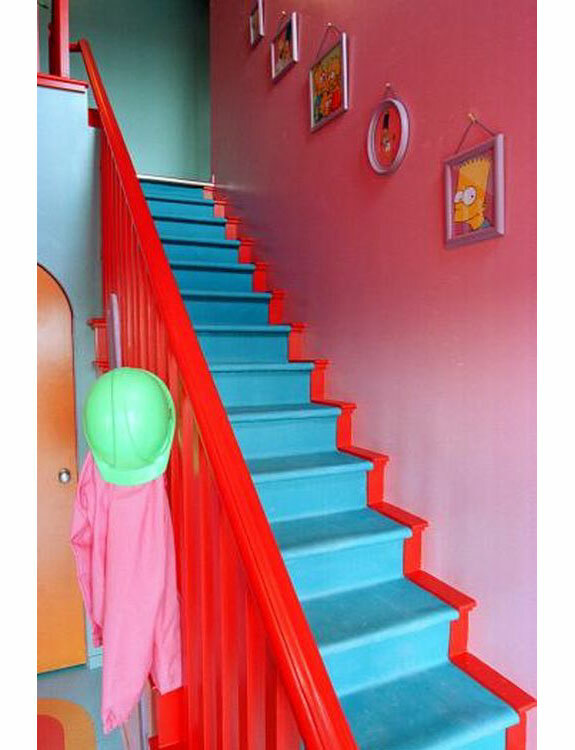 Since someone made the Simpson’s house real, what is going to be made next……….the house from Family Guy, or better yet, how about a building from Futurama? When they were having the contest to win this house, we took a tour. 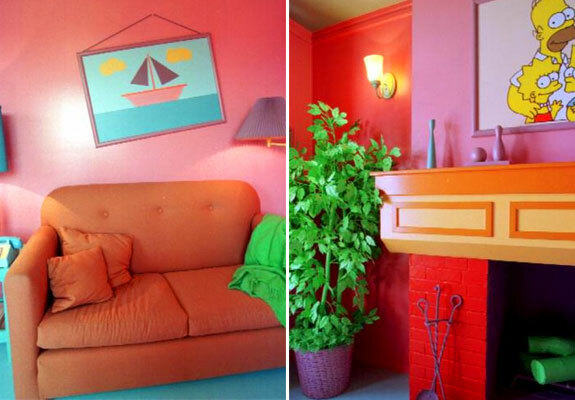 It was a cute idea, but did not seem like the house was really liveable in some respects. In fact, I just live about a mile from here. When up for the contest, it was part of the requirement that the house had to be repainted, probably as part of some home owners association, if I remember correctly. Several people have thought so, but it isn’t. We’ve even provided the street address where the house is. Ha! All that’s missing is Stampy the Elephant.